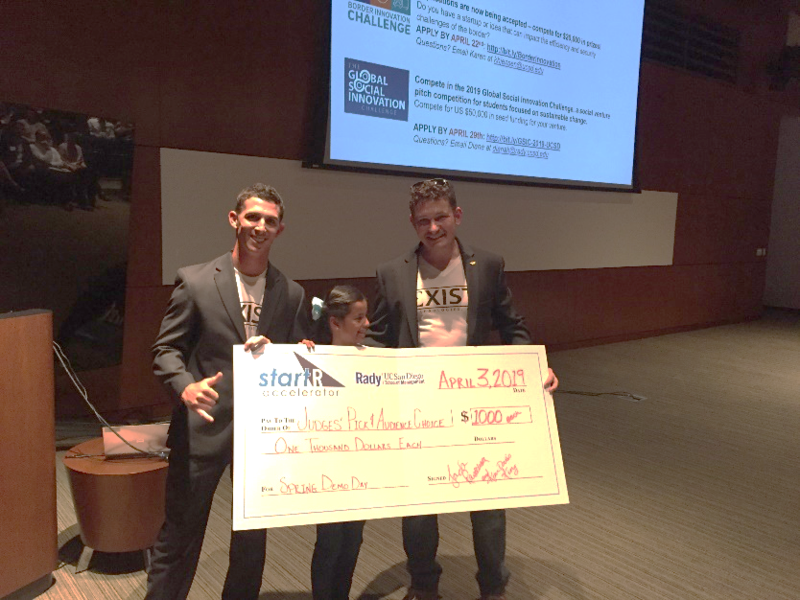 StartR, founded by a group of Rady students in 2013, is a non-profit six-month accelerator program homed on the Rady campus. The program includes a workshop, mentoring, advice and access to other resources for early-stage companies. StartR has been highly successful and currently has one hundred and thirty-seven teams who have gone through the program. Eight of these teams have also been accepted into EvoNexus. There are fifty-five unduplicated companies that are active, and $63.8 million has been raised so far. 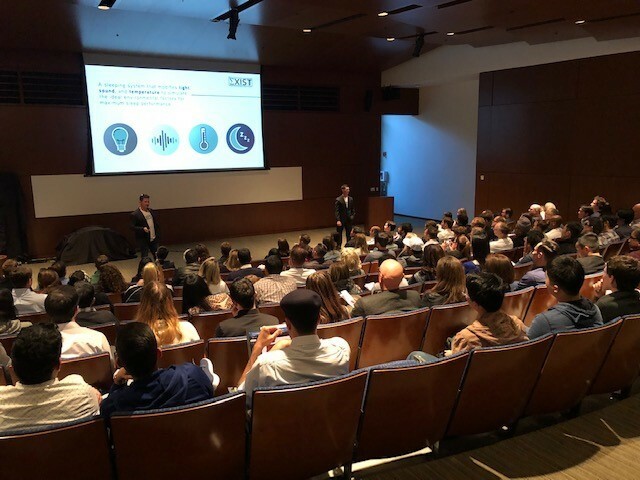 Along with the 6-month accelerator program, StartR also encourages students to partake in the StartR demo day, where entrepreneurs pitch their business ideas to students, faculty, investors, and professors. Nine companies chose to participate this year in the StartR DemoDay. 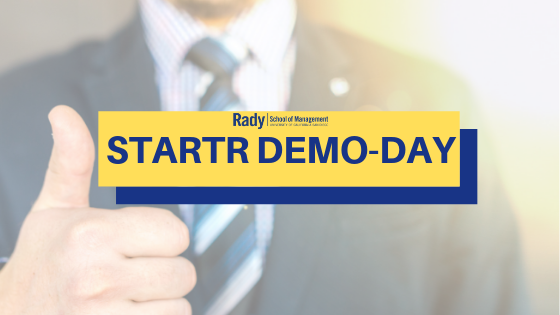 In the past, the only StartR group to partake in the demo day are Rady MBA students and alumni, but this year was a little different. This is the first Demo Day event where teams from multiple StartRPrograms were invited, rather than only MBA students. All of the teams under StartR Accelerator include Rady, Inclusion, Impact, Veteran, and Teen. This was a monumental step, and highlights Rady’s commitment to champion and spotlight entrepreneurs of all styles! At Demo Day, the teams dressed in slacks, polished shoes, and newly pressed blazers, lined up one by one, while they anticipated putting their best foot forward in hopes to win a prize, or attract the attention of a potential investor or partner. As they shared their pitch, they stood in front of the audience with refined power points, apps, and even a real, live business prop itself, including a sleeping pod! The audience listened to each hopeful entrepreneur, all while cheering on their family and friends. The StartR programs spotlighted this year, and the ones highlighted below with their company pitches, include: StartR Rady, Inclusion, and Impact. AngioX: – AngioX Therapeutics is an early stage biopharmaceutical company that develops novel therapies for patients with rare Cerebral Cavernous Malformations (CCMs). Freightracker: – This Company is bringing IOT solutions to the transportation industry in order to streamline operations and reduce costs bycreating a device which allows users to track their freight anywhere in the world. SurfUp – An automated surfboard rental station that is paired with a smartphone application to make the surfboard rental process convenient for beginner surfers and tourists on the beach, in-front of stores, resorts, restaurants, and much more. bou: Bou is a small device that can save, transfer, and emit smells instantly in various circumstances to enhance consumers’ daily experiences in different settings including while watching movies, playing video games, shopping, online shopping, relaxing, etc. Virtual Sleep Environment: A virtual sleeping pod which increases human performance, entraining a natural sleep-wake circadian rhythm. This makes it easy to sleep anywhere, at any time! Inclusion: Open to students across UC San Diego and designed to highlight diversity, teams must have at least one leader from a traditionally underrepresented population. Felicity CBT – Aims to better the mental well-being of users by providing cognitive behavioral therapy at the convenience of a mobile application. Athlete Initiative: A sexual violence prevention program and app for college student-athletes, helping to prevent sexual violence on campuses, where one in five students are currently affected. Family Proud – Connecting patients and families to the technological resources necessary to effectively maximize their quality of care. 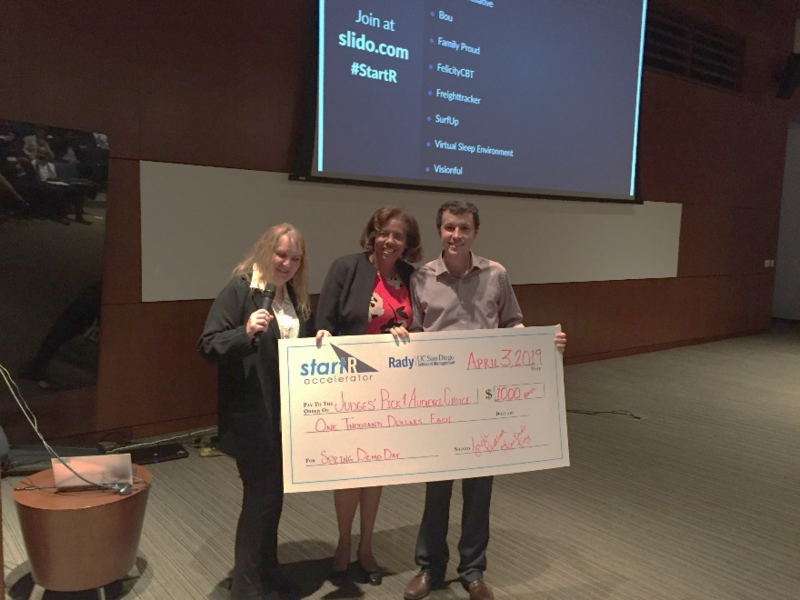 It was a competitive battle at Demo Day, and each entrepreneur deserved a prize, but, there are only two awards—a judges choice, and an audience choice. The team who presented the most polished, well thought out idea according to the judges this year, was Thomas Fontes from Freightracker. Thomas walked up to the stage with excitement, as he won a $1,000 prize towards his business. Thomas is working on creating a custom device with AT&T, in hopes to have a freight tracker on the market by 2020! Rady School is excited to see where Thomas’s business will take him in the future! You can contact Thomas at Thomas.fontes@rady.ucsd.edu. The team who won the audience choice award was Robert Sweetman with Virtual Sleep Environment. Robert brought a real, live sleeping pod to his presentation that tracked the brain waves of the sleeper, revealing to the sleeper if their brain was active, calm, or busy. This would allow the sleeper to find peace and calmness and fall asleep at any time! Robert is working on getting the sleeping pod in airports, and creating stations for consumers to sleep anywhere, anytime, and especially before or after a long flight! You can contact Robert at Rob@existech.us for questions or thoughts. Rady School of Management is proud to house and educate students and alumni, who are passionate about entrepreneurship. Building on the success of their startups, all of the teams who presented will be continuing to pursue their business ideas in hopes to continue to succeed in pioneering a new, innovative way to solve and better our world!